Many folks take a good deal of pride in carrying their own personal firearm. Various laws and conflicting views make it difficult to know exactly where to draw the line between what is and what isn’t allowed. Are you up-to-date on laws concerning firearms? Hand guns do NOT need to be registered with the State of Georgia. This also means that when a firearm transfers ownership (whether a direct sale or via inheritance) you do not need to transfer the weapon in your name. That is, unless it’s one of those NFA-regulated items that should be registered with the ATF (Bureau of Alcohol, Tobacco, Firearms and Explosives). Can You Carry in Restaurants? Yes. There is no law prohibiting you from carrying in a restaurant or bar. But keep in mind that the owner or their agent has the right to ask you to leave if they are uncomfortable with your weapon being in the establishment. Some states do have laws regarding whether or not firearms can be brought into a place of business based on the percentage of alcohol sales that take place. The opposite is true for churches. Firearms are not permitted in places of worship unless a church has specifically mentioned that they are allowed. What if you get mixed up in allegations of concealed weapons, an unlawful sale, or unlawful possession? You’ve got expert defense help on your side. 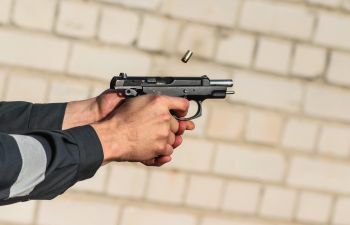 Atlanta Criminal Defense Attorney Richard Grossman has decades of experience in successfully handling cases involving firearms. If you’ve got a legal concern about your right to carry, call our office at (678) 358-6555 to schedule your free and confidential initial meeting.